Assassin’s Creed IV will likely be a divisive entry in the series. The emphasis on sailing the seas and ship-to-ship combat over the usual sneak, stab, run gameplay (not to mention the shift in story away from many of the series’ touchstones), almost makes the title feel like it should have been a whole new IP. In many ways, it probably should have been just that. Since its inception, the Assassin’s Creed series has generally been about two things: free run/Parkour-style mechanics, and shanking people from haystacks. All subsequent titles were refinements of these ideas with one notable callout: the third title offered a brief glimpse of what it would be like to sail the open seas. Assassin’s Creed IV took that glimpse to heart. It is both the successful implementation of arcade-style sailing, and a highlight reel of what’s wrong with the game’s underpinnings. A quick disclaimer before getting much further: I’ve kept things as spoiler free as possible for folks, but there may be an occasional slip here or there. On the historical side, Assassin’s Creed IV takes place during the “romantic” age of piracy at the start of the 18th century in the Caribbean (known then as the West Indies). 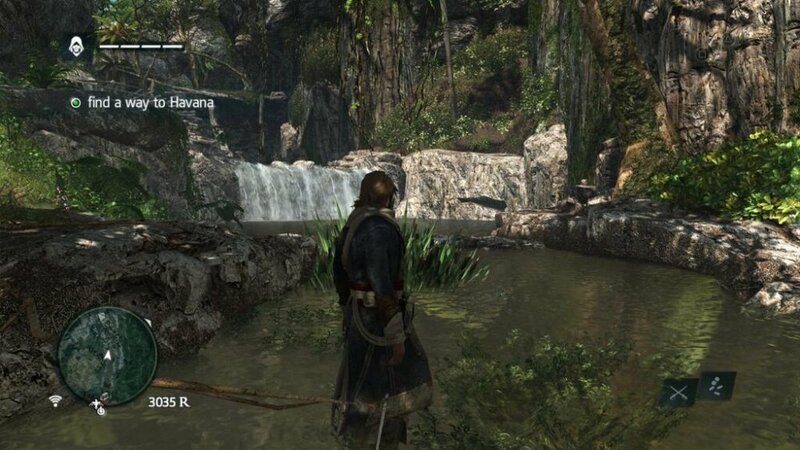 Our protagonist this time around is Edward Kenway, a Welshman seeking gold and treasure in order to live the comfortable life back in England. Of all the “assassin” characters to whom we’ve been introduced over the course of the series, Edward may be my favorite. He feels, in many ways, the most realistic. Caring little for the motives of either the Templars or the Assassins, he simply wants to be free to seek treasure, earn his fortune, and go home to his wife. It’s a good change from the usual protagonist that seems to blindly adhere to the creed despite many of the revelations that come along the way in the other games. On the future side is protagonist #23517; ok, even assigning them a number is giving them more identity than is fair. You’re no longer Desmond Miles, the bartender turned reluctant assassin thanks to sitting in a lounge chair and watching your ancestors murder people in creative ways. Instead, you’re a nameless, faceless employee of Abstergo Entertainment - a media conglomerate that is mining the past memories of people using the Animus device in order to come up with new ideas for movies, video games, and TV shows. There’s a lot of meta commentary in these future sequences about the state of the entertainment industry that’s all a bit on the nose, but it’s good to be in someone else’s future shoes for a change. You will spend less time out of the Animus than in previous entries, and you won’t have as many inane tasks to perform when you are. There are even some interesting tie-ins to the overall story/plot of the series, so if you’re a long-time fan, you’ll find some pay off here for a couple of big plot points in the overarching series. 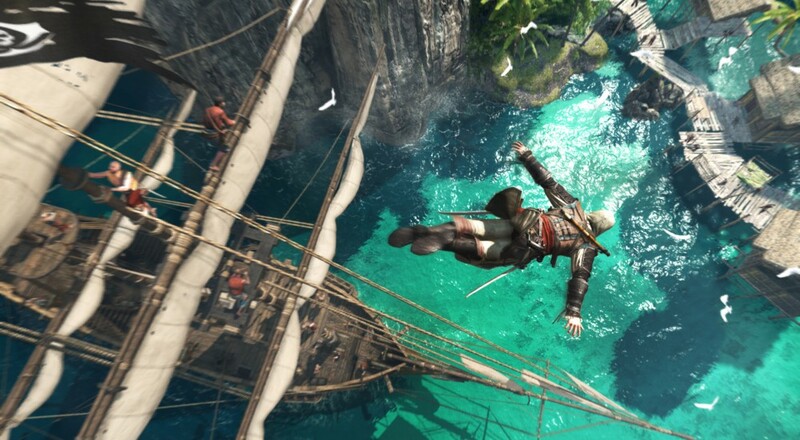 Assassin’s Creed IV’s real strong point is in its gameplay. Specifically, the sailing parts. The very first time I got my own ship and was given the reigns to begin pillaging and plundering as I chose, I didn’t want to do anything else. The “freedom” you were given in previous entries to romp through historical cities always felt a little confining. It’s like you were trapped in a snow globe. You’d run from one edge of the city to the other and inevitably hit that invisible wall preventing you from going further lest you “desync.” Entrance and exit to the cities were only allowed through designated areas. There was an entire countryside sprawled out before you and your ancestor must have decided it wasn’t worth visiting or remembering. In Assassin’s Creed IV, outside of the three major towns that have those same type of gates, you’re free to walk up to the wheel of your ship any time you like and sail off into the horizon. It is true freedom.